Great Egret in flight - St Petersburg Florida - Nikon D300 Nikkor 80-200mm f/2.8D @ f/4 ISO 200 1/2500thContinuing with the bird trending blog posts, I had the opportunity to photograph a great egret up close and in flight. As you can see I did not have to use a 600mm lens to get this tight of a shot of the great egret. Nor was I in an airplane. The secret to being able to get a shot like this without spending $10,000 is to . . . go to The Pier in downtown St. Petersburg! Even the base of The Pier itself is rather high off the water often putting you at eye level to passing and even incoming birds. great egret - The Pier in St Petersburg Florida - Nikon D300 Nikkor 80-200mm f/2.8D @ f/4 ISO 200 1/2000thThis afternoon was a rare very overcast Florida day. That meant I did not have to worry about getting my back to the sun or anything like that. In fact, shooting a white bird like this great egret is best done on an overcast day I think, not counting sunrise or sunset time of course. So, without having to worry about the light because the light was the same from any direction, the last location factor to be mindful of was: background. I often say bird shots are make or break first because of the light, and second because of the background. 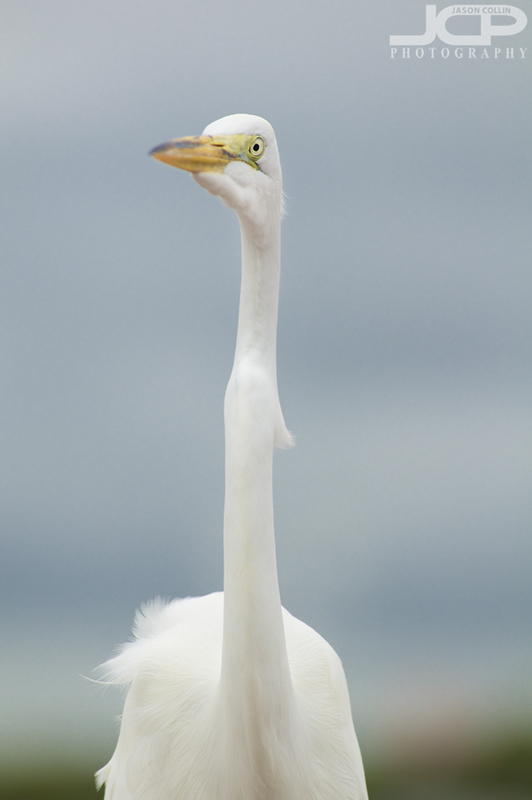 Without a fantastically clean background, your shot will just not stand out from the other thousand great egret shots taken every day in Florida. Of course one of the ways to reduce the impact of the background is to just make it all creamy bokeh. Still, color of the bokeh does come into play. Do you think the transition of brown at the base of the above photo works, or would it be better all blue-gray? I thought it added another point of interest in the frame myself. Let me know in the comments if you agree or disagree. One last thing about the photo, looking at a bird like a great egret is strange and reminds of the rare times Beavis every looked straight ahead. There is just something off about it! Ah, and notice how I set the focus on the bird's eye. Without the eye in focus, the shot would have been a fail, or I would have had to pass it off as "artistic style" of some sort! Great Egret beak - The Pier St Petersburg Florida - Nikon D300 Nikkor 80-200mm f/2.8D @ f/4 ISO 200 1/2000thOne last tip on photographing long-necked birds: they are an awkward shaped creature, and it is often not the most flattering to include their entire body in the shot, especially when standing, and doubly especially when they are standing on a concrete wall! Nothing takes the nature out of your shot like a human-made structure! Hence, in the above shot I focused on framing only a part of the great egret. I used the rule of thirds and placed the eye in the upper left most third. I had the bird looking into the empty space of the frame. 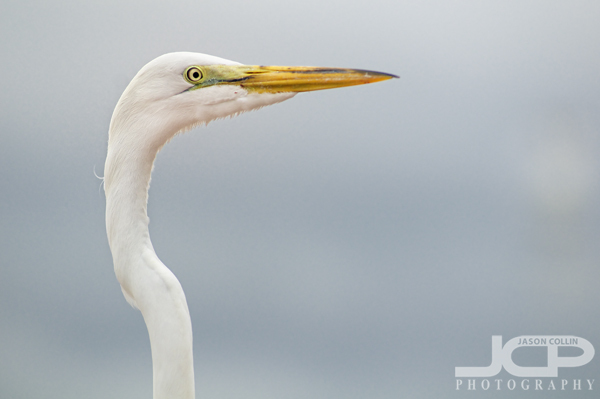 I of course also made sure the background was clean and the bokeh color complementary to the white of the egret. Plus, I just think it looks cool to see this long neck protruding from the bottom of the frame. Please share any of your Florida bird photography tips and links to your own shots in the comments below.